Oh hey I got my WD as well! There's a TON of Genestealer Cult stuff, including a battle report. Gerücht - Zukünftig keine Datenkarten? Keine Ahnung warum. Schon der Editionswechsel, zu teuer in der Produktion? Die Matte ist eher etwas für Killteam-Spiele, es sollen aber zukünftig weitere erscheinen. I've not seen anything mentioned about this here, so i thought i'd bring it up. From this week stores are able to order a 40k events pack called Kill Team: Into no mans land. It's a set of scenarios, some that are actually meant for regular 40k, not Kill Team, plus some counters, tokens and badges. If your local store had the Age of Sigmar Campaign set, you'll get the general idea. From what i've been told it's part of an effort to support activities in FLGS stores and give us owners a bit of extra support. One nice aspect is that if we buy one of the supporting stock bundles, we actually get additional Promotional Store Credit, which allows stores to offer prize support. It certainly makes it easier to entice people to join in campaigns and events at Ad Hoc Games if i can offer them a prize at the end. Just thought i'd post about it, if only so you can chat to your own local stores and see if you can get something going there. This can't be real can it? Can it?????? Man beachte den Schriftzug der Box! Hatte Hastings auch gerüchtet. Mortarion wahrscheinlich zusammen mit dem "Plague Army-Release" (Zitat Hastings). No. I only know of one other not-FW primarch in the pipeline. He'll be "Team Imperium" and part of setting up the story for 8th. There may be more I simply haven't heard about, but as with Daemonkin, I can assure you that there is no plan to go through the four Chaos Gods with symmetrical releases. That's not how the 40K story evolution for the next year or so (from the tiny bits I know) is set up. Eine deutsche Übersetzung müsste es im dt. 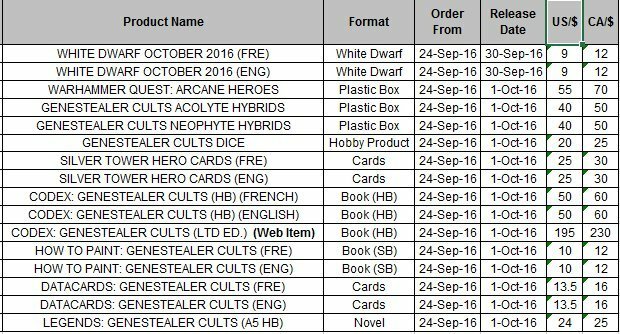 GW Webshop im Burning of Prospero Eintrag (rechts unter Downloads) geben, spätestens morgen um elf. Bloodbowl is November and 1k sons in December.